Settlement Motor Inn is in the lovely Riverina. 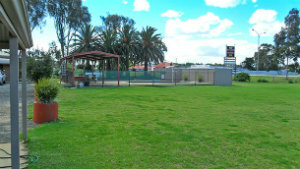 Deniliquin offers country hospitality and outdoor activities for everybody. Situated on the Edward River, Deniliquin has many historical buildings and the award winning Peppin Heritage Centre. 280km from Melbourne, Deniliquin is an easy get away from the city. Deniliquin has many river walks and bike trails, bird watching hides and tours, the largest Red Gum Forests and thriving wetlands. The river is perfect for fishing and skiing, or cruising on a house boat. Deniliquin has the world famous “Deni Ute Muster”, Easter “Blues and Roots Festival” with international acts, awesome Fishing Classic, Matchmakers Festival, Rodeo and Race Days. Settlement Motor Inn is the closest accommodation to the iconic “Ute Muster” site, which is now of international standards. You can visit local winery cellar doors and tour the “International House Rural Heritage” at Clancy’s of Conargo Winery. There is the Deniliquin Town Walk, Backroads Trail the Long Paddock to enjoy. 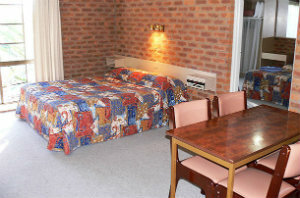 Settlement Motor Inn has accommodation to suit the corporate traveller with our large room with table and chairs and lots of bench space. If you are looking for a quiet retreat the Spa Suit with 2 person spa will relax and invigorate you. Large families will be comfortable here with our family room accommodation sleeping up to 6 people.